Image1: because of an erect posture that wasn’t considered in cutting, the undersides are showing a surplus length and the seat seam is pulling in the gap as a consequence of a too short rise of the topsides. The error shown is all too commonly seen. The undersides have too much length in the gluteal area, piling up below the waist seam and unpleasantly pull the seat seam forward into the gap area. A perfunctory view will cause some colleagues to assume, the undersides just have a bit too much length for comfort, which gets more obvious because of the erect posture and can be removed by widening the crotch point. This view is quite right. The customer’s posture, which is slightly erect, and the underdeveloped buttocks were not regarded sufficiently when cutting. Otherwise cutting and assembling would have been executed completely differently. d) or if he prefers a trouser that is comfortable while sitting, but will show some length when walking or standing. The customer has an erect posture and a slightly forward hip. Using a normal pattern template the pattern should have been altered according to the sketch. In this case probably a pattern template with a crooked seat angle was used causing the additional length in the gluteal region. 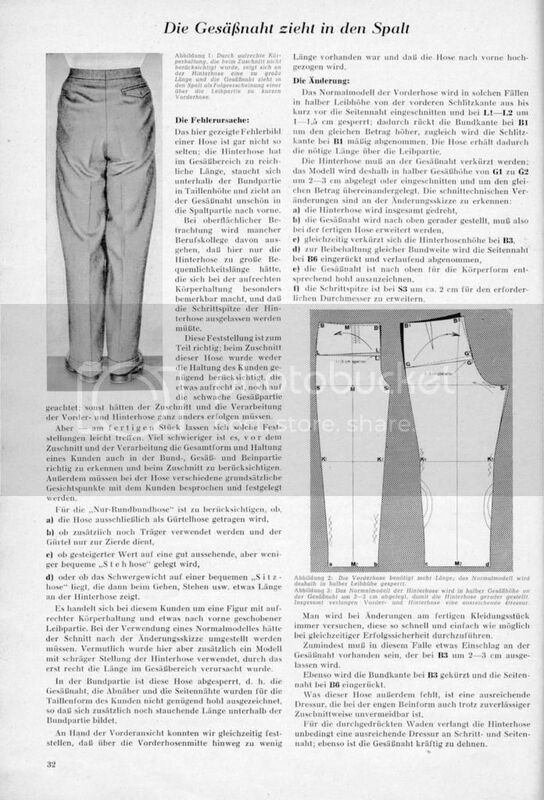 In the waist area the trousers are “blocked”. * That is to say, the seat seam, the darts and the side seams were not drawn hollow enough for the customer’s waist form, which causes the additional length to pile up below the waist seam. Looking at the front view we could diagnose, that the topside is lacking length at its centre and the trousers are pulled up towards the front. The normal topside pattern is slashed at half the rise from the fly line, almost to the side seam and hinged open for 1— 1.5 cm at L1-L2. This raises the waistline at B1 for the same amount and makes the fly line go inward moderately at B1 at the same time. Thus the trousers get the necessary length for (across) the trunk area. (for the rise?). f) the crotch point must be widened for 2 cm at S3 to achieve the correct diameter. the seat seam is reduced by 2—3 cm at half the seat height, so the undersides are straighter. The topsides and undersides certainly require sufficient ironwork. There must be at least some inlay at the seat seam, because it needs widening there for 2— 3 cm. The waistline is shortened at B3 and decreased at B6. These trousers also lack sufficient iron work, which cannot be avoided in trousers with narrow legs, even when they are cut correctly. For the prominent calves, the undersides need sufficient ironwork at the inseam and the side seam; the seat seam must be stretched heavily as well. * With thanks to Schneidergott for this explanation. "Abgesperrt" means "blocked" in older texts. In this particular case the waistband doesn't allow the cloth/back trouser to go up, so everything is pushed downwards. 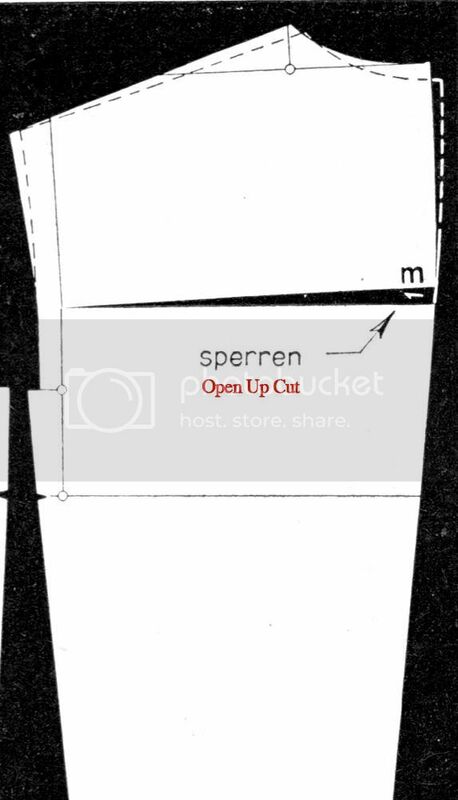 "Gesperrt" or "sperren" of a pattern means "to open (-ed up)". "Kneifen" for that matter means the opposite, you close/ overlap a part of a pattern. Edited by Schneiderfrei, 25 June 2015 - 09:52 AM. I thank peterle for doing the bulk of this translation and Schneidergott for his insight into a tailoring term that was unknown to us. Thanks again, guys, for another translation. When these are finished perhaps someone will put them together as a pdf. And thanks to HenryHall for spotting 'festlegen' as 'decided'. The correction has been made. If links are passed to me, I would be happy to compile a pdf of all these excellent translations. I have only posted these articles as you see. If you wish to copy them and convert them to a pdf that would be ok. The image files are stored in photobucket and can be downloaded just like SG's originals. I'll get on with it, it's not as if I haven't the time. I'm always looking for things to occupy my mind, and time. Edited by tombennett, 25 June 2015 - 08:04 PM. I've found four articles. Is that correct, and are there anymore? No worries m'dear. I'm not going to rush, I pace all my tasks as part of my pain management programme. The fifth and final is now posted. Edited by Schneiderfrei, 26 June 2015 - 12:38 AM. I have asked Schneidergott where these pages came from. He has said they came from an old Rundschau book called "Wir Ändern".